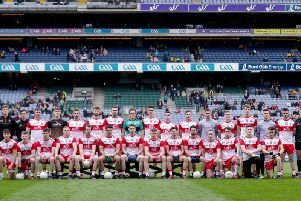 While the Academy last participated in the St Patrick’s Day final in 2011, media coverage has understandably concentrated on Cavan’s forty year wait to reach the premier colleges final. Like the Academy, Cavan have put in impressive performances in the knock-out stages, but there is little doubt that they will feel the full weight of four decades of expectation on their young shoulders when they take the field tomorrow (Tuesday). The Breffni boys overcame a much fancied Omagh CBS side in the semi final, winning 1-12 to 2-4. After going down to an early Omagh goal, Conor Smith and Thomas Edward Donohue points put them in the lead, and Donohue’s goal left the score at 1-7 to 1-3 at the break. They extended their lead to six points coming into the final quarter and, despite another Omagh goal, they held on to book their place in the final. Cavan were very comfortable winners in the quarter final, defeating St Eunan’s Letterkenny 2-15 to 0-7. St Patrick’s Cavan boast two college All-Stars in their ranks, with centre half back Cian McManus and midfielder Thomas Galligan picking up the individual awards. This Cavan side have been very successful down through the school competitions at this age group. “In fifth year, this team beat what would have been our current year 14s by about thirty points in the Rannafast Cup quarter-final,” Academy half forward Cormac O’Hagan commented. While a lot of the Academy players will have had experience of going up against Cavan before, they present a somewhat new prospect for coach Ciaran Gourley. “From my own experience, we wouldn’t be overly familiar with Cavan,” he told the Times. “I remember the current year 13s would have played them in a Brock Cup final a few years ago. That particular occasion, the game went to extra time and we managed to scrape a win that day. “From the knowledge of that game, we know that Cavan will not give in and they’ll fight for everything.